The very variable stature of Selfheal can be confusing, but the same species stands tall in wildflower meadows and yet in lawns seems able to escape decapitation by ducking down whenever the blades of a mower approach. This downy creeping perennial rarely grows taller than 30cm and often the flower heads are no more than 5 to 10cm above the ground. The oval leaves are usually untoothed or only slightly toothed. 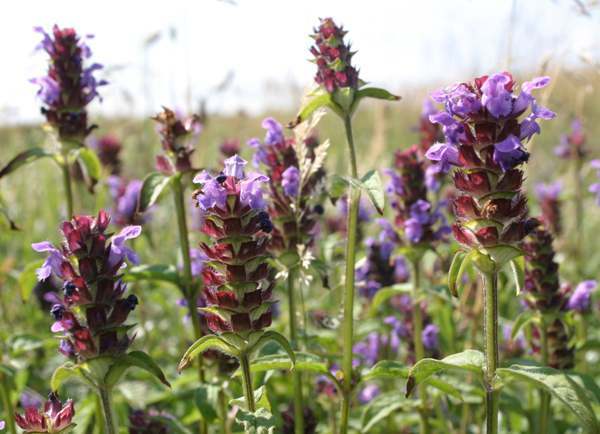 Box-shaped and usually oblong in side view, hardly tapering at all, the flower heads of Selfheal are very distinctive. Mostly the flowers are violet, but pink and white forms also occur, with the individual two-lobed flowers 10 to 15mm long. The upper lip is a helmet-like cowl, while the lower lip is divided into three lobes, the central lobe longer than the two side lobes. Prunella vulgaris is widespread and common in Britain and Ireland, and this species is native to mainland Europe, Asia and North America. 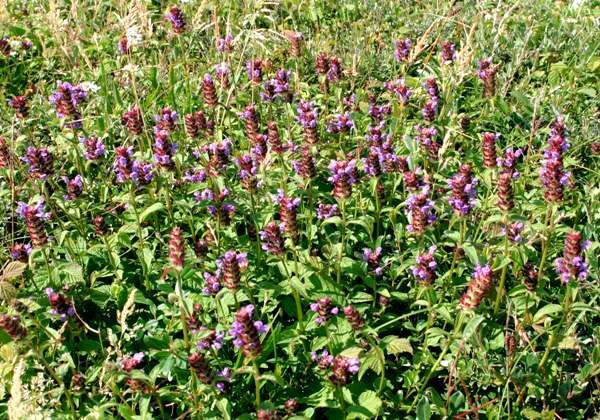 Selfheal is tolerant of poor soils and grows in meadows, hedgerows and ditches. This rapid coloniser of wasteland will persist even in grassy paths, lawns and public parks that are subject to frequent walking. 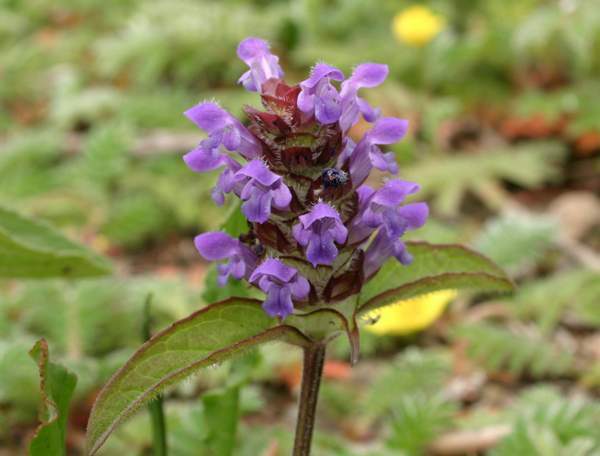 The first flowers usually appear in late May or early June, and in some sheltered places Selfhealcontinues flowering until the first frosts of winter arrive, so that some years in southern Britain it is possible to see the violet flowers of Selfheal from spring through to midwinter (early December). 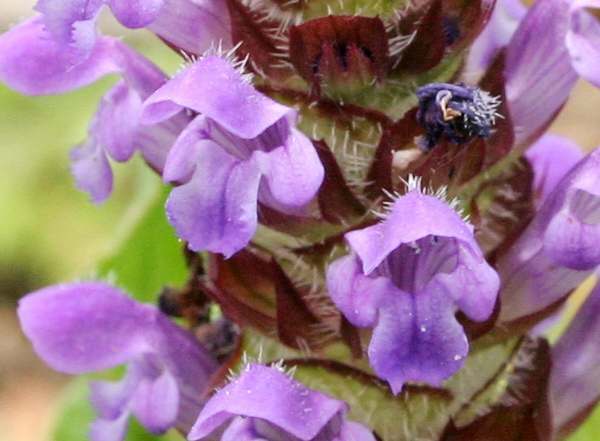 The common name Selfheal, sometimes written as Self-heal, refers to the plant having been used as a treatment for wounds and bruises until recent times. The slightly bitter-tasting leaves of Prunella vulgaris are sometimes used in salads. The generic name Prunella was given to this plant by the great Swedish naturalist Carl Linnaeus, who was aware of its use as a treatment for the disease Quinsy; he intended to use the German term for Quinsy, which is die Braune, but unfortunately Linnaeus misspelled it as Prunella. Under the international conventions of botanical naming this error cannot be corrected and so Prunella it is. Girls who are given the name Prunella may feel better about it knowing that it the origin is an unambiguous reference to a pretty wildflower rather than a name shared with an unpleasant streptococcal infection of the tonsils! The specific epithet vulgaris is Latin and much used in botanical naming; it simply means common. Bugle Ajuga reptans has flowers that are much more blue, and there is a distinctly bronze tinge to its upper leaves. The much more lax-flowered Ground Ivy Glechoma hederacea is another common wildflower and, like Selfheal, a member of the family Lamiaceae; its leaves sometimes take on a reddish or purplish tinge. The photographs shown on this page were taken at Kenfig National Nature Reserve in South Wales in June.